Wildfire season is here. In the U.S., wildfires destroy 4 to 5 million acres of land every year. In recent years, wildfires have incinerated up to 9 million acres of land. The hot and dry air, strong winds, and combustible vegetation allow wildfires to spread up to 14 miles per hour. 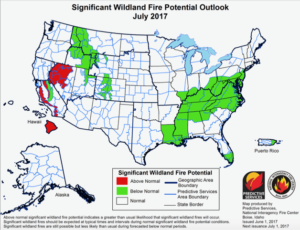 So far in 2017, wildfires, also known as wildland fires and forest fires, have burned more acres of land than the size of Delaware and Rhode Island combined. This data from the Predictive Services of the National Interagency Fire Center is educated speculation. The frequency and size of wildfires is growing on a yearly basis, and all areas should have Perimeter Guard for any and all potential wildfires. Be active not reactive when it comes to property and life safety. 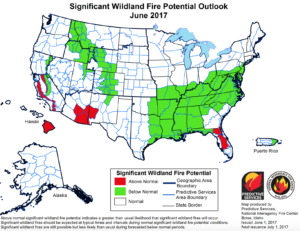 In June, wildfire threat on the coast of California, Hawaii, the southeast region of Arizona stretching into New Mexico, and central Florida rises. 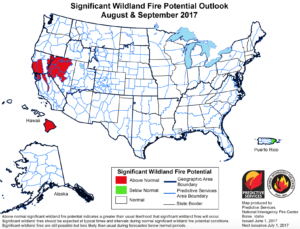 Coming in July is a significant wildland fire increase in Hawaii, the coast of California, and the majority of Nevada. This August and September, have Perimeter Guard on standby for forest fires in Hawaii, Northern California, and Nevada. A wildfire has no boundaries on what it will burn. The most common solution firefighters use is dousing the fire with water and applying fire retardants on its fuel. These solutions only work in the right scenario: the size of the wildfire and how fast firefighters respond to it, how close the nearest fire hydrant is, and how easy it is to reach unburned wildfire fuel. Without the right conditions, the common wildland fire treatments will not succeed without severe damage to nature, civilization, and at worse, life. Be active not reactive, use Perimeter Guard to combat wildfires.